So you’ve found a great article while browsing the web, but wish you could read it later on your iPhone? 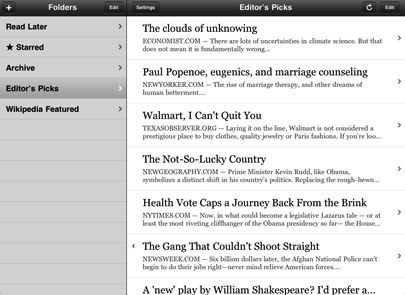 The Instapaper iPhone app is your best solution. We all love things that work without too much fussing around, and Instapaper and its iPhone app have perfected simplicity when it comes to saving articles you want to read later. The app sells for $4.99 in the App Store, and it is something that is well worth the price considering it automates almost everything. So you find an article on while browsing on your MAC or PC (and soon to be iPad) and wanna save it for later reading. Just tap the “Read Later” instapaper bookmarket that you install on your Safari, FireFox or Internet Explorer and watch as a nifty little window flashes to confirm it was “Saved!”. That’s it! End of story, no syncing, emailing, or other weird notes taking required. 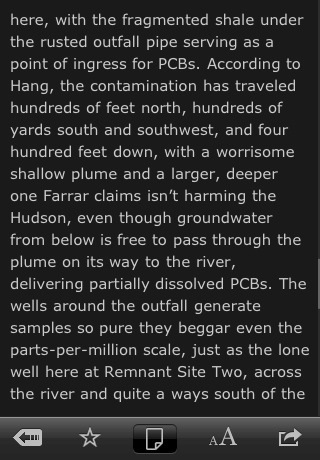 Next time you open the Instapaper app on your iPhone, iPod touch or iPad, you’ll see the story you saved listed, with its text formatted perfectly for you to read sans ads and all distractions. No need to sync anything manually, no need to format text or fuss around with remembering URLs. Signing up for an Instapaper account is also super painless. All you need to do is enter an email address. You log into the Instapaper site with your email address and you may choose to create a password for your account. In your online account install the bookmarklet. In settings you can pick how you want your stories parsed out. Text only removes all images from the paper and may add some additional copy to the page. There is a new text+images parser that retains relevant images from the article and shows them to you inline with the copy. It’s not perfected yet, but the Instapaper folks say they are working on improving their logic. The Instapaper iPhone app itself has a flat simple user interface for unobtrusive reading. Navigate your automagically synced Read Later list, Editor’s Picks plus Starred and Archived stories. Though automated each time you re-launch the app and every few minutes thereafter, a refresh button can force a sync with the server. The Reading pane gives you intuitive features, most notably the app remembers your reading position so you can jump it on your subsequent visits. Half read status is indicated using a half circle on the list view. The second great feature is auto-scroll which when enabled scrolls the document as you tilt the iPhone up/down. It would be great if there was an option to simply start a continuous downward scroll as well. Third built in feature that we love is instant dictionary lookups for any word you highlight. Why isn’t this feature built into all web browser? If you find yourself reading in bed try turning off the Rotation option so you won’t go into spastic mode. Pagination is another feature which you can use in place of auto-scroll. You can follow steps (this part is not automated) for installing the “Read Later” bookmarklet for your Mobile Safari. Instapaper makes reformatting easy with customizable font types, font sizes, margins and line heights. The default black text on white background can be inverted to the Dark interface. You can star anything, archive it, move it to a folder, share it, and open the original in Safari. Note: The iPad version of the Instapaper app will look and feel much like the iPhone version as stated by developer Marco Arment on the Instapaper blog. He plans to utilize the landscape-orientation list screen functionality and as you’d expect everything will be bigger and easier to read. We hope to review the iPad version of Instapaper next week as Marco plans to release it on iPad’s opening day, no matter what bugs may exist on its first version. If you’re serious about reading and being productive, Instapaper is a must have app. It’s one of those apps that once you start using, you will wonder how you ever lived without. Now if only I could figure out a way to use this app to sync and read notes, it would make 2 other apps obsolete as well. Sample the lite version of Instapaper Pro on your iPhone for free. AppSafari review of Instapaper Pro was written by Joe Seifi on March 28th, 2010 and categorized under App Store, Bookmarks, Featured, News, Reading, Utilities. Page viewed 5435 times, 1 so far today. Need help on using these apps? Please read the Help Page.